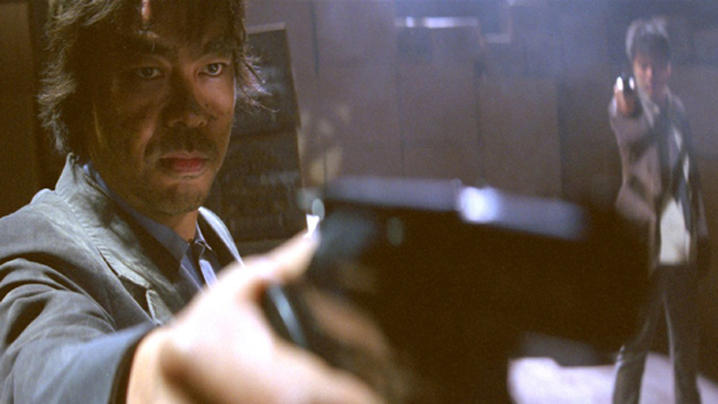 Above: The "mad detective," played by Lau Chin-wa, and in the typically warped side of the frame, rookie cop Andy On. After so many stoical, staunchly confident films from Johnnie To, it's always refreshing to see one of his collaborations with fellow Milkyway Image director/producer Wai Ka-fai, who brings a welcome wackiness to a film like their latest co-directed work, Mad Detective. A splintering look, a gunsmoke drab palette, and an off-kilter mise-en-scène using wide-wide angles from long lens, harsh lens flare, and nihilist attitude—the film has a beautiful, grimly amusing, honed purity to its world so that we may accept the insanity to follow. Insanity, literally, in fact; Lau Chin-wan plays an ex-detective who has a strange psychic talent that involves empathetically reenacting crimes (including being buried alive and kicked down a staircase stuffed in a suitcase) and whose principal side-effect is a schizophrenia that "allows" him to see the inner personality(ies) of those around him. Our "mad detective" is contacted to solve a crime by a baffled rookie played by Andy On, and in a Tourneur film (or most others, for that point), the story would cast its gaze at the rational youth's flirtation with the beguiling, unsettling success of the disheveled, wildly irrational veteran (who is also sockless and missing an ear). But To and Wai have no such pretensions. Mad Detective is genre exercise through and through, humor and pathos enabled with supreme precision due to the psychic-tint on a traditional internal affairs plotline, which distracts from the conventions with the feats, pathetic and fantastic, of Lau's weary, optimistic/depressive schizo. In turn, Wai and To give the film an unfriendly, mysterious look devoid of safety and desiring comfort; even Lau's kind-hearted wife is a figment of his imagination, and a respected, but personality-less captain deserves Lau's ear as a departing gift. Only the score by Xavier Jamaux (genius composer behind To's other recent film, the near-musical Sparrow) and Lau's fantastic performance lend a knowing humor to the vaguely ghastly emptiness in the film world. All in all, it weaves a tonally erratic but always inventive path. Strange but understated, Lau's schizophrenia, On's uncertainty, and the sublimely restrained panic of cop-suspect Lam Ka-tung (who has seven inner personalities, all fighting for control) are all treated as par for the course as if this were a regular policier. There are To's stoical tidings, allowing us to treat normally a film whose eerie insanity Wai helps displace to the film's form. Jokes with the true personalities only Lau can see, and grimmer tidings of a film beset by slanting shadows, askant, warped lines, and playful spatial disorientation between character's points of view are put in a general atmosphere of a world without goodness and belief, wrapped in a kind of professional, ethical nullity. Mad Detective's wacky distraction is playing a darker kind of game than one may think.